When I was going over the vegetables I had made I noticed I didn’t have any mushrooms. WHAT is this madness I say …No Mushrooms and it’s a witches conservatory. Well I certainly had to remedy this. 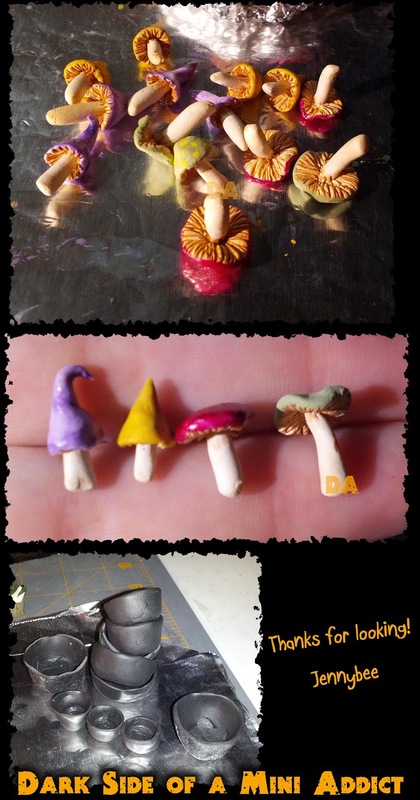 So out came the clay and with inspiration from my dear friend Jane and her wonderful creations, mushrooms were made. These were fun to make and fairly easy to do aside from time to time the clay would get too warm/soft. I think maybe if I work with thinner clay next time maybe I’ll keep a baggie of ice nearby to touch with the tips of my fingers or something to cool the clay a bit. Do any of you have this problem and if so what do you do? I also picked up some black Fimo to make some kettles/cauldrons/pots. This I had even more problems with because I didn’t realize until after I opened the package and started smushing it around its soft Fimo. This really got floppy the thinner the container got, and then after I cooked it I noticed it still had some give. Has anyone used soft Fimo and if so what do you use it for? Today I’m going to hop over to the local craft store cause they have the clay, acrylic paint and foam brushes on sale. The three things I seem to be going through like a wild woman. Have a great day everyone! They are just so right in color and form to a witches house. Your mushrooms look great! I'll have to try making some of them but I keep putting it off since I'm no good with Fimo. if your projects are too mushy you can bake them again at a lower temp and a bit longer..that should firm them up then put it in the freezer for a couple of min. Thanks Jennifer, they were fun to make and quite easy. Bagh there is no such thing as no good, just not have had enough time to play with the clay. Besides your lack of clay play time has nothing on your table and desk creations!!! Your writing desk is awesome. Also thanks for the award. Me encantan como te han quedado las setas, has hecho un buen trabajo con ellas.